It is an exciting time to be an engineer in aviation and aerospace. New materials are enabling aircraft to run faster, safer and more efficiently. Competition is driving innovation. Small aircraft and drone technology is rapidly advancing. Make no mistake – like any other industry, aerospace has its challenges, some of which are being inadvertently created by the introduction of new materials and rapid technological advancement. There is pressure on suppliers, manufacturers and airlines to keep costs low, demonstrate regulatory compliance, maintain safety and so on. However, advances in software are enabling engineers to meet such challenges while also pushing the limits of what has been previously possible, enabling them to do and achieve more. So what are some of the key trends and opportunities which aerospace engineers can capitalize on using the latest software? There has been a lot of development in aerospace materials and technologies over the last 10 years, including zero-fuel aircraft, use of graphene and carbon nanotubes and electrification. Up until recently, the testing and roll-out of such technologies in the aerospace industry has been slow in comparison to other sectors like automotive. But software has transformed how engineers can test these new materials, especially ones which are introducing greater complexity and increasing the number of physical elements that need to be monitored, such as adaptive materials in wings that enable them to change shape as you fly. Using software to model the performance of new technologies before testing can help engineers spot how to fix any issues ahead of test flights, saving them time and money. Software is also available to help engineers harness the benefits of predictive analytics and predictive maintenance. Programs with reference examples and algorithms are especially useful to engineers new to predictive maintenance in helping them get up and running quickly. These are used to develop models which can monitor the condition of aircraft and systems as well as estimate the remaining useful life of machines – the expected life or usage time remaining before repairs or replacements are required. Tools are also available that help track machine health while in flight that enable the receiving of alerts and data in real time, and enable the scheduling of maintenance while the aircraft is still flying to its next destination, minimizing machine downtime. This enables engineers to save time and money by undertaking preventative maintenance – work performed when machines are not operating – and of course fixing broken machinery. Advances in wireless communications and the development of small aircraft, notably unmanned aerial vehicles (UAVs), are benefiting us hugely as a society in several ways. For example, drones are being used to deliver packages, capture aerial photography, assist in monitoring the progress of large construction projects, even saving lives by locating people for rescue. However, drones need careful management. Fortunately, lots of UAVs are fitted with obstacle detection and collision avoidance sensors, the data from which is used to generate 3D maps via simultaneous localization and mapping technology, and software algorithms to help drone operators keep track – and control – of their aircraft. Tools such as GPS or RFID geofencing can be used to prevent other UAVs trespassing, for example onto airport runways, by setting up software to trigger alerts when a mobile vehicle enters a virtual geographic boundary marked as prohibited. Software helps engineers enormously in visualizing, simulating and testing their designs, making it easier to approach problems and come up with solutions, and increase creativity. It is great to see more software tools entering school and university curriculums and being used in training programs, as software serves as such a good learning tool, motivating students to enter careers in aerospace engineering. Software and other tools also help students develop practical, transferable skills in high demand, preparing students well with the skills and knowledge they need for real-world projects. Europe and the USA have rich histories in aviation and aerospace and today face fierce competition from other rapidly growing markets including China, South Korea, India and Brazil, where the cost of production is lower. To compete, firms must innovate. But how can they do so cost-effectively? Software is key to staying agile. Engineers must be able to model, simulate and analyze aerospace vehicles, saving engineers valuable time and money developing and testing aircraft before live flights and meaning more resource can be channelled into design and innovation. Various programs and software also help companies differentiate their products and services. For example, in the commercial airline market, passengers may not notice much difference between aircraft in terms of the mechanics and parts. Where airlines can distinguish their offer though is in the customer-facing software they use, for example by using the latest AI technology, in-flight entertainment to make film suggestions based on previous selections and personalized inflight offers. Software is making a huge difference to the aerospace industry. It is enabling engineers to capitalize on new materials and harness data analytics for predictive maintenance – having a knock-on effect of saving time undertaking aircraft and system maintenance and maintaining revenue streams. Software is also helping advances in the development of small aircraft and drones, inspiring the next generation of aerospace engineers by arming them with the right skills and driving innovation. Software is making aerospace engineering a more exciting industry to be part of than ever before. 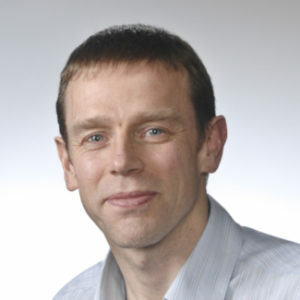 Chris Hayhurst leads the MathWorks Consulting Services organization in Europe, managing a group of engineers who cover many industries and every aspect of MATLAB and Simulink product capability. Chris works with automotive, aerospace, electrical machine, and industrial equipment companies to assess and optimize their development processes and adoption of Model-Based Design. Before coming to MathWorks, Chris was involved in the design of flight control systems for helicopters, working with Simulink to model future helicopter dynamics and control strategies. He holds a degree in electrical engineering from Cambridge University and is also active in the Institute of Engineering and Technology and in encouraging engineering and computing education in schools.